Save money when buying QuickBooks compatible checks. Intuit’s checks work great in your printer, but they can cost quite a bit. 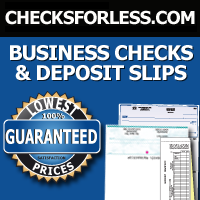 These checks are fully compatible with all versions of QuickBooks, and have optional envelopes as well. Printing checks in QuickBooks can save you a ton of time, but Intuit’s checks are kind of pricey. We have found this company that will print checks compatible with all versions of QuickBooks, as well as the other accounting programs out there. We turned to them because there was an option for two signature lines, which Intuit doesn’t offer unless you special order them. You can even get matching window envelopes, too! Expect to pay about 40% of the cost of Intuit’s checks. Be the first to review “QuickBooks Compatible Checks” Click here to cancel reply.